Whether you use a laptop, PC, or tablet to listen to music, videos, and games, you can’t settle for the factory settings if you want stellar audio quality for your media. You need to invest in sound technology that will bring your computer’s audio to the next level. Follow these three simple steps to make sure that you have the ultimate audio experience directly through your computer system. In all likelihood, the sound card that came with your computer is either one of two varieties: a true external card that plugs into your computer’s system, or a motherboard that is integrated with sound functionality. The second is not a true card, but is still referred to as one. In general, plug-in cards feature better sound quality than integrated cards – and are easier to upgrade as a result of their plugin capabilities. When shopping for an external sound card, be sure to choose one that is compatible with your computer’s OS, hardware, and digital surround codec. Upon installation of the new card, be aware you may need to download additional drivers to maximize the card’s functionality. The newest – and, arguably, the best – sound cards now come with HD 3D compatibility, enabling you to enjoy the full spectrum of sound quality of HD by means of streaming, downloads, or discs. Again, the media player that comes with your computer may not be the best fit for your needs. Different media players can differ greatly in how much processing power they use, what types of files they can play, and how well they integrate with the rest of your computer’s systems. Sound enhancements utilities, like SRS HD Audio Essentials from DTS, work in conjunction with your media player in order to give you greater control over your media’s audio settings. 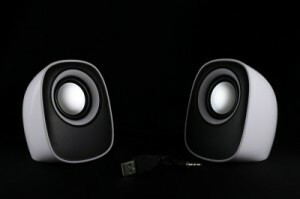 The sound enhancements available include bass, depth, spaciousness, clarity, TruBass, and Focus and Definition (as WOW). You can use the tool to adjust a wide variety of audio elements to your precise standards on an interface designed to harken back to old-school stereo systems. Sound enhancement utilities can be used to optimize your speaker system, whether it’s a 2-speaker system, 5.1, and beyond. Use the preset options for headphones, internal notebook speakers or external speakers or take control and use the intuitive “advance settings” panel to customize the experience for your ears only. Amping up your PC’s audio capabilities doesn’t have to be a trial – or result in a quest for the nearest helpdesk or computer shop. With the right sound card, media player, and sound enhancements utility, your computer can give you an immersive audio experience that rivals a home theater.